A "hoodie" is a sweatshirt with a hood attached to it. As with any piece of clothing, hoodies sometimes need altering because they are too big. You can make simple alterations to a hoodie, including taking in the seams and making the hood smaller so it fits more snugly on your head. 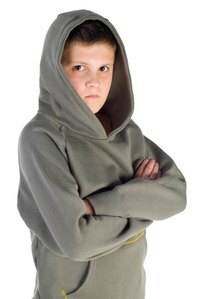 Hoodies are a popular piece of fashion, and altering one yourself can be more cost-effective than purchasing a new one. Turn your hoodie inside out and put it on. You need to turn it inside out so that the seams face inward after you sew it. Fit the sweatshirt as closely as you'd like to your body and pin the excess fabric together using the straight pins by gathering the fabric together and pulling it tightly. Pin all the way down to the bottom of the shirt and under the arms. Remove the sweatshirt carefully, so the pins stay in place. Sew a seam along the lines you have pinned on the sweatshirt beginning at the bottom of one side of the shirt and sewing up through the armpit of the shirt. Try on the shirt. If you are happy with the fit, cut away the excess fabric on the inside. The excess fabric will be left from the new seam you have sewn and will irritate the skin if left on the inside of the sweatshirt. If you are not happy with the fit of the shirt, turn it back inside out and loosen or tighten the seams as necessary. Put the sweatshirt back on. Pull the hoodie over your head. Gather the excess fabric at the back of the head and repeat the pinning process you used for the body of the sweatshirt. Remove the shirt again and sew along the pinned seam. Remove the excess fabric if you are pleased with the fit.